Meet a cat with astonishing feline foibles, opinions, eccentricities, tricks, and mysterious human abilities. All cat owners are sure to identify with more than one of Ping’s feline foibles, opinions, eccentricities, tricks and mysterious human abilities. Betty Hyland’s family pet, a Siamese cat, lived more than eighteen years along with his good friend, Hadrian, (the dog who dribbles and sneezies). Since then, all encountered cats have been compared with this extraordinary Siamese. Yes, he did think that the Thanksgiving turkey was cooked for him. He did have a miserable vacation near Passamaquoddy, Maine. He did have an enemy named Orange Cat. And, yes, Ping usually slept in a sunbeam. Clever, witty, and heartwarming. A treasure chest of feline foibles. 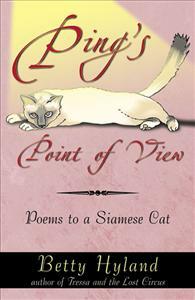 A must-read for all poets and cat-lovers.